We apologize for any inconvenience and look forward to reopening in time for the Fall Semester with exciting new exhibitions. In the meantime, Museum staff will be taking programming ‘to the streets’ with a series of free education programs, including In-School Art Programs (Fully Booked), Mini-University activities, public art projects, campus art tours, and much more. Further details below. We will be sharing updates and additional programming on this page, on our news page and social media channels throughout the closure. In the event of rain, outdoor activities will be cancelled. Please follow our social media channels for updates. Meet in front of the McMaster Museum of Art for a guided tour of buildings in the central campus area from Hamilton Hall to Divinity College. Meet in front of JHE by the clock for a guided tour that will cover buildings in the south area of campus from the Reactor to the Health Sciences Centre. Due to the Museum shutdown, the 2019 McMaster University BFA Graduation exhibition (aka SUMMA) will be hosted off campus at The Cotton Factory. Please join us at the Cotton Factory on Saturday, April 6, 11 am – 3 pm for the Opening Celebration and MMA sponsored student awards. 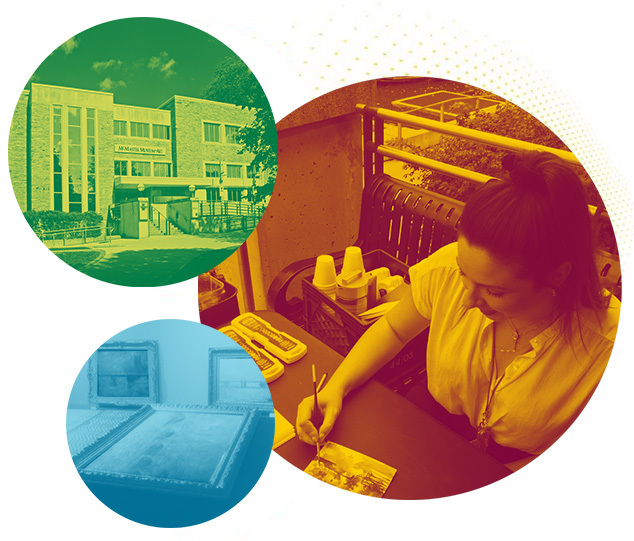 Until then, follow the graduating class on Instagram @mcmastersumma2019 for a sneak preview of the artists’ work.